Most of your kitty's diet should be a nutritionally complete cat food, but you can give her a treat from your plate every once in a while. You just need to know how to choose feline-friendly snacks with nutrients she needs. Cats are meat eaters, plain and simple. They have to have protein from meat for a strong heart, good vision, and a healthy reproductive system. Cooked beef, chicken, turkey, and small amounts of lean deli meats are a great way to give them that. 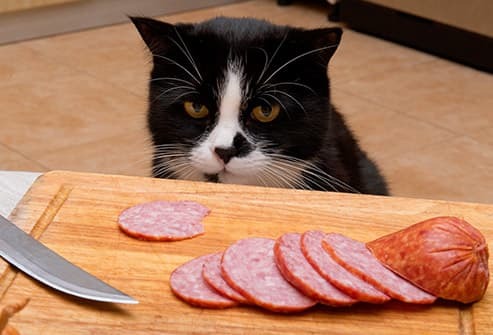 Raw or spoiled meat could make your cat sick. If you wouldn't eat it, don't give it to your pet. Oats have a lot of protein per calorie, and they're easy to make. Many cats like corn, and polenta, a coarsely ground cornmeal, has a good texture for them. You can try brown rice, barley, and wheat berries, but you may need to mash them first. Cats tend to like smaller grains like millet and couscous. Just make sure any grains you give are cooked so your kitty can digest them fully. Whole wheat breadcrumbs are OK, too. 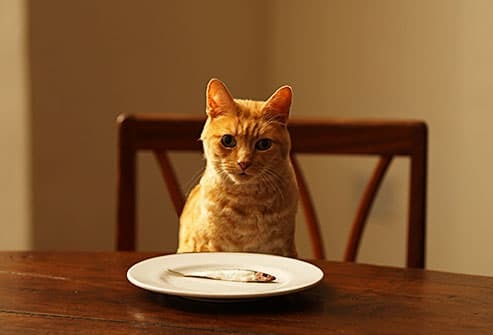 Fish have a lot of omega-3 fatty acids, which help your cat's eyes stay sharp as well as help with arthritis, kidney disease, and heart disorders. Canned or cooked fish is fine for a treat. But don't share your sushi -- raw fish isn't a good idea. 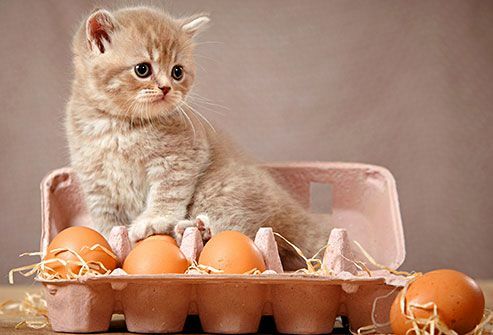 Eggs are another super source of protein for your cat. But make sure they're cooked. 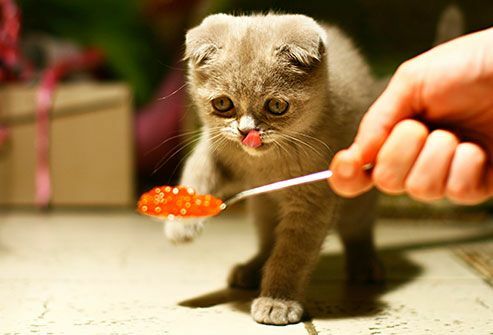 Like raw meat and fish, raw eggs can harm your kitty. 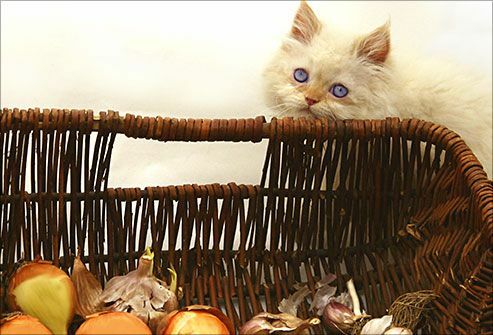 Not all cats like vegetables, and even fewer like fruits (felines can't taste sweet flavors). But they are a rich source of vitamins, and they're loaded with fiber and water to help with digestion. Try fresh cucumber or cantaloupe, steamed broccoli, or asparagus. But you might have better luck slipping him a veggie burger -- really -- just be careful the patty doesn't include onions or garlic. 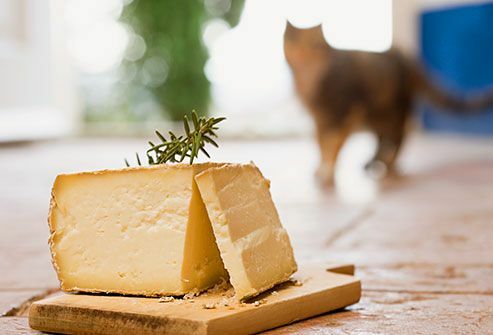 Cheese is a high-protein snack that's fine for your cat in small amounts. But the protein in cheese is less "complete" than the kind in meat, fish, and eggs. Also, many cats' tummies can't handle dairy, so go easy on the cheesy treats, and skip the saucer of milk. Don't let curiosity, well, you know. Keep foods not meant for your cat in a place she can't get to them. Kitty should only get "extras" occasionally. His regular meals should be a high-quality cat food (look for a statement from AAFCO -- the Association of American Feed Control Officials -- on the label). If you give him food that's meant for people, talk to your vet about what and how often you should add to his diet. Overfeeding can lead to an overweight cat and health problems. American Veterinary Medical Association: "Raw Pet Foods and the AVMA's Policy," "7 Foods You Should Avoid Feeding Your Dog or Cat." 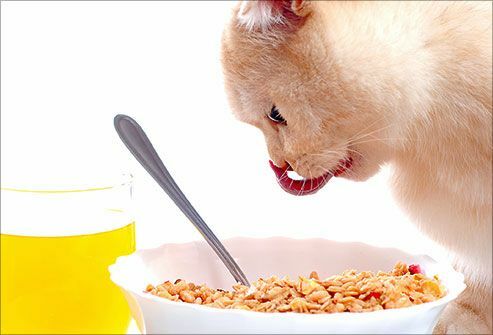 American Society for the Prevention of Cruelty to Animals (ASPCA): "Pet Care: Foods That Are Hazardous to Cats," "Nutrients Your Cat Needs," "General Cat Care." 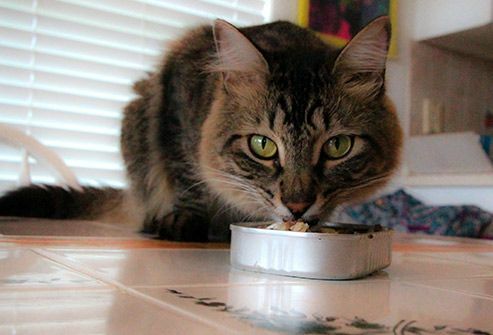 Cornell University College of Veterinary Medicine: "Feeding Your Cat." European Pet Food Industry Federation (FEDIAF): "Nutritional Guidelines For Complete and Complementary Pet Food for Cats and Dogs." Li, X. PLOS Genetics, 2005. Pitcarn, R. Dr. Pitcairn's Complete Guide to Natural Health for Dogs & Cats, 3rd Edition, Rodale, 2005. Virginia-Maryland Regional College of Veterinary Medicine: "Nutrition for the Adult Cat."